LG UK6400: Is this Black Friday 4K TV deal any good? | What Hi-Fi? 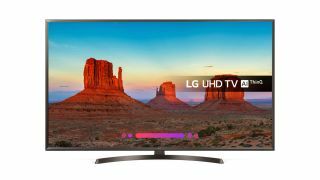 LG UK6400: Is this Black Friday 4K TV deal any good? For the last few years, LG has consistently proved it can make some of the best TVs around. Granted, we're talking about the brand's premium OLED TVs, which have more than proven their worth against rivals at the top end of the market. But what about those who can’t afford over £1000 (and up to £5000) for an OLED TV? Of course, LED TVs are still the most popular and widespread TV type in people’s homes due to its accessibility and affordability. And LG has several 4K Ultra HD LED ranges - such as the UK6400, whose 43UK6400PLF (43in), 49UK6400PL (49in), 55UK6400PLF (55in) and 65UK6400PLF (65in) models have been on the end of some generous Black Friday treatment, now available between £329 and £629. The short answer: The UK6400 TVs are middle-sitters within LG’s Ultra HD 4K TV series, which lies below the company’s premium Super Ultra HD and OLED TV ranges. But while they aren’t among LG’s very best models, then, they more than cover the basics for the modern TV, with 4K resolution, HDR support, smart apps and even AI and voice control functionality. So if your priority is screen size, value and smart features, and you don’t mind missing out on the very best audiovisual experience offered by much pricier TVs and the utmost slimness of OLED, we’d trust these to offer a good all-round experience. Sandwiched between LG’s UK6300 and UK6470 4K TV ranges, the 43UK6400PLF, 49UK6400PL, 55UK6400PLF and 65UK6400PLF TVs boast the two most important visual technologies: 4K (3840 x 2160) resolution for pin-sharp images, and High Dynamic Range (HDR) for wide and subtle colour reproduction. On the latter, there are several important HDR formats, including HDR10 and Hybrid Log Gamma (HLG) - both of which you’ll be glad to hear are supported by these TVs! Dolby Vision is a dynamic metadata format that LG supports in its premium TVs, however unsurprisingly these budget TVs overlook it. That means you won’t be able to playback Dolby Vision content available on Ultra HD Blu-rays and streaming services such as Netflix, but considering most HDR content is available in HDR 10 instead of or as well as Dolby Vision, that shouldn’t bother too many people after a TV bargain. These TVs actually utilise what LG calls its ‘Active HDR’, too, which the company claims is a better application of HDR. And what of smart features? Running LG’s webOS platform (which has long-been our favourite for its feature-set and intuitiveness), these TVs boast smart apps such as Netflix, Amazon Prime Video and UK catch-up apps like BBC iPlayer, All4 and ITV Hub, plus tons more. Then there’s Freeview HD for broadcast telly, and of course multiple USB and HDMI ports for connecting a, say, games console or Blu-ray player. LG has promised these TVs will receive a software update this year gifting them built-in Google Assistant voice control, meaning users will be able to control the TV and ask it questions simply using their own voice. The TVs also support Amazon’s version of voice control, Alexa, however that requires an Alexa speaker such as an Amazon Echo. As for the picture, needless to say LG has a good track record. If its OLED TVs are anything to go by, we’d expect good levels of sharpness and rich yet natural colours. LG says it’s worked hard to improve the viewing angles of this panel compared to last year’s equivalent, too. Verdict: While we can only truly vouch for the top-ranging LG OLED TVs we’ve reviewed in the last year or two (it’s proven increasingly difficult for us to get hold of samples of lower-ranging TVs), the UK6400 models’ are certainly well specc’d when it comes to network smart apps, voice control and multiple HDR support. If the picture quality was up to scratch, you could be looking at some of the best-value TVs this Black Friday. At these prices, it’s fair to say we’d take a punt on them. Want an alternative? See our round-up of the Best Black Friday 4K TV deals, including this fantastic Award-winning Philips 50PUS6703 for just £399. MORE: Which 2018 LG OLED should you buy?